Digitize, or get left in the dust? That’s the pivotal question facing today’s factories, logistics centers and power stations. Industry 4.0 is fast becoming the new standard, and that means change. IT and machinery manufacturing are converging, new business models are popping up like mushrooms, and AI is making its way into factories. And everything revolves around one central element: people power. From 23 to 27 April, more than 5,000 exhibitors from 75 different nations will be presenting technologies for tomorrow’s factories and energy systems in an action-packed industrial technology showcase themed“Integrated Industry – Connect & Collaborate” . 60% of these exhibitors will come from abroad. The top exhibiting nations, after Germany, are China, Mexico, Italy, the Netherlands and France. The rapid move towards smarter, more integrated processes in production is feeding through into the logistics sector in the form of intelligent, connected technologies like robots, drones and voice assistants. These technologies and their transformative effects on logistics will be explored in depth by more than 650 exhibitors at the CeMAT intralogistics show, which this year is being staged in parallel with HANNOVER MESSE. 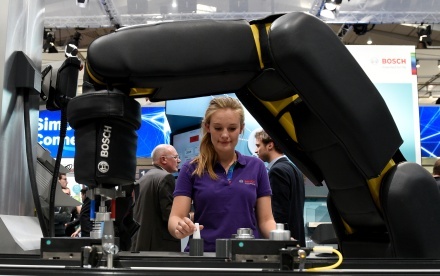 “HANNOVER MESSE and CeMAT will feature solutions from leading manufacturers of automation, energy and logistics technology, the biggest names in robotics, and global IT and software providers. For five whole days, Hannover will be the global hotspot for the digital transformation of industry,” said Köckler. The official Partner Country of HANNOVER MESSE 2018 is Mexico, and more than 160 Mexican companies and institutions will be using the opportunity to profile their country as a forward-looking, innovative industrial powerhouse. Mexico is also a highly attractive destination for foreign investment – a message that will be championed by a 450-strong Mexican delegation of political and business leaders. The delegation will be headed by none other than the Mexican President, Enrique Peña Nieto, who will join his German counterpart, Chancellor Angela Merkel, at HANNOVER MESSE’s official Opening Ceremony. Other high-level political decision-makers expected in Hannover include Michel Barnier, the EU’s chief Brexit negotiator, Maros Sefcovic, the Vice President of the European Commission, and Günther Oettinger, the EU Commissioner for Budget and Human Resources. Next: Position Sensor Detection for Hydraulic Cylinders – A world first!